A unique experience for the senses at Fairmont Le Château Frontenac! 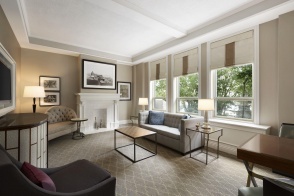 Your package includes accommodation for one night in a Frontenac Suite room, a copious buffet breakfast and a delicious 5-course dinner at our Bistro Le Sam. Large and beautifully decorated, these suites combine the luxury and refinement of their experience with a spectacular view of the St. Lawrence River. They are composed of a master bedroom connecting to a large parlor with a sofa, arm chairs and a bathroom. Ideal for entertaining, the parlor sits approximately ten people.